ShadowHaken, holding a bloody frying pan: PLEASE HOLD, WE ARE EXPERIENCING TECHNICAL DIFFICULTIES. Hello, everybody, welcome back to our seasonal sequel guide. I’m ShadowHaken, and fortunately for everyone involved, I am your actual host. Summer is coming and a new season is upon us! 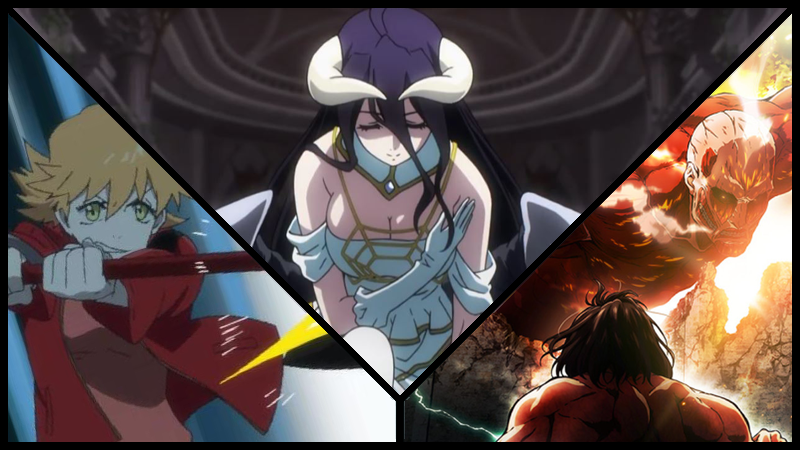 And that means that besides enjoying the beach or drinking lots of liquids to avoid a heat stroke, there are new sequels of our favorite animes! From Attack on Titan to Fairilu and even passing to the new generation of the Earth’s Mightiest Heroes, the sequels are here and so are we to inform you about them! Now, I would like to apologize to you dear readers. No, not because of the “incident” that you witnessed some paragraphs above (although I feel we might be in front of a PR nightmare down the road), but what happened is that we failed you in our search to measure the hype in a scientific way because… We were busy playing Rage of Bahamut! (And Granblue Fantasy, Fire Emblem Heroes and a very long et cetera) So instead we decided to measure the hype by the Rage of Bahamut standards! And how have we measured and what is more common and what is rarer? Well… That’s the magic of gacha…So maybe something uneventful could be a big thing, while something big can be pretty common! (Translation: It was decided on a whim and we didn’t think things through). Now the ‘stars’ mean the hype the series gets, while the ‘dots’ (say) how many entries the series has had before, for example. Yamishibai has 7 stars, which means something pretty big, and 6 dots, since it’s the 6th season! Did you get it? I’m sure you did! Now let’s go to the series! About the Series: In a world where huge naked people are running in the streets... In a world, where it’s okay to make holes in buildings while shooting strings out of strange device strapped to your waist, just to fly through the streets like birds, there is secret which can save the world — in someone’s basement. Join us for the never-ending journey to just get to Eren’s cellar. About the Series: BanG Dream! Girl’s Band Party! follows the up-and-coming all-girls band Poppin’ Party as they experience the various ups and downs of being musicians in high school. Though the primary protagonists are PoPiPa, as they call themselves, there are four other all-female bands in the same age group, who are having similarly turbulent careers: Afterglow, Roselia, Pastel★Palettes, and Hello! Happy World. Each has their own balance of skill and heart against troublesome and wacky characters, so it makes for a fun, expansive cast, but it keeps a clear direction due to focusing on the “main” group. Season 1 focused on the formation of Poppin’ Party, while the upcoming season 2 has been revealed as focusing on Roselia. There’s not much detail about Pico yet, other than the fact that it’s a short-form, chibi-style romp with all five bands confirmed to appear. It’s probably not too big a leap to assume it’s going to focus more on the shenanigans than the actual problems the girls run into, especially given the general tone of the mobile game based on the franchise, which is available in the west. While it has cutscene story sections about both the formation of all 5 bands and its own original story about them all meeting, it also has a whole lot of comedic skits showcasing the girls’ wildly varying personalities bumping heads with each other, both internally within each band and between different bands, as many are friends or relatives of other bands’ members. These skits are delivered in a similar chibi style as Pico, so one could assume this will showcase some. What You Need to Watch: 1 season of BanG Dream! About the Series: Kazutaka Hyoudou is the president of the Teiai Corporation and the owner of various gambling places. One day, out of boredom, he ordered his right hand, Tonegawa, to make a “game of death” and since it’s Tonegawa’s job (and the other people that work for Hyoudou) to keep their boss in a good mood, they will have to work together in order to make their boss happy! These are their comical misadventures! About the Series: The everyday life of these idol girls, including some funny anecdotes or embarrassing stuff they suffered in their common life! About the Series: The Fairilus: Small Fairies that represent flowers or bugs, these mysterious beings lives in the magical world of Little Fairilu. These fairies are born with a key and if they can get to open the correct door they will mature into full-fledged fairies. Now these mythical creatures can sometimes enter the human world and if they can get a human partner both of them can help each other to reach their dreams! Lip is a very kind and good nature fairilu, although it’s fairly easy to make her cry. Still she won’t give up, nor will her friends and the humans they might get to know in the human world! About the Series: Many years after the events of FLCL, teenage Hidomi is disillusioned with her life, thinking it’s completely average and boring when a mysterious teacher comes to her school. It’s Haruhara Haruko! And suddenly, what was once ordinary becomes extraordinary! Genre(s): Slice of Life, Comedy, Sports, Drama. About the Series: The Iwatobi High School Swim Club returns for its third season as freestyle ace Haruka Nanase, backstroker Makoto Tachibana, breaststroker Nagisa Hazuki, and butterflies Rei Ryuugazuki look to further their swimming careers while facing off against Samezuka Academy Swim Club and its team captain and best friend to the Iwatobi four, Rin Matsuoka. And maybe even become professional swimmers in the process! Oh yeah, something something men service. About the Series: Makoto is a young boy who got super powers due to an evil gene manipulation experiment. Now he, alongside other youngsters with super powers like Adi, Kuroe, Miss Marvel and Spider Man (Miles Morales), will be joining forces with the mighty Avengers like Captain America, Hulk, Thor, Wasp and Iron Man under the label of “Future Avengers” while at the same time they try to get a hang of their super powers! About the Series:About 23 years have passed since the time of Gao Mikado. Now his son Yuga Mikado has been able to make a name for himself in the world of games for his great skill in any kind of ludic entertainment, so much that he has been known as the “Ace of Games”. Trading Card Games are foreign to Yuga until one day he decides to check the game “Buddyfight”. There, he will meet his buddy, the Dragon Gargantua… In that moment, a new adventure will start for this duo! About the Series: Gintama is the tale of Sakata Gintoki an accomplished Samurai of the Joui War that saw Earth subjugated by the Amanto a race of aliens. Following the war Gintoki leads a lazy life leading the Yorozuya Gin-chan. An odd jobs business lending helping hand — for a fee — with Kagura, a young, immensely strong alien, and Shinpachi, a bespectacled idol otaku, all the while being accompanied by Sadaharu, a gigantic dog/alien. Together they have had many adventures that over time have begun to change the political status quo of the world. Continuing on with its final arc, Gin and his allies have to fight for their lives and those of whom they love against a growing number of enemies new and old. About the Series:: In an anthropomorphic world, the cheerful cat Tapio alongside his friend, the grumpy feline Kuehiko are College students, and this is their life in school and various odd jobs! What You Need to Watch: 1 season of Hataraku Onii-San! About the Series: : Three Girls, three different stories, one place. All the girls’ stories will be heard and witnessed by you and in your One Room. About the Series: Every time you start a new game and create a character, think twice about what you want to be in the world, as you might get stuck there. Momonga patiently waited for the servers to be shut down, when suddenly he’d realized that something is terribly wrong. The game is not over, he didn’t log out, and on top of that, all non-player characters now have personalities, including an excessively-in-love and obsessive succubus. What will Momonga do now? About the Series: Aoi is a shut-in girl who has acrophobia (fear of heights). Still, her best friend Hinata is a girl who loves mountains and climbing them. One day, they decide to go to a mountain and see the morning sun like they did when they were little. These are their adventures. About the Series: The mysterious Masked Man has returned and with him, new horror tales. The stories aren’t connected and are short, so they only will tell simple and chilling stories about humans facing the supernatural. About the Series: Zoids! These are the strongest life-forms. With metal bodies, animal minds, and fighting spirits, they stand at the top of the ecosystem! When Zoids and humans formed the ultimate connection, a hidden power was awakened! Its name is… WILD BLAST! While specific details are scarce - we had to have ProtonStorm translate that official summary for us - Zoids Wild appears to be a totally new sector of the franchise, aimed far more directly at young children than previous entries in the series. At the same time, it’s also a throwback to some of the earliest roots of the franchise. Zoids has always been about toys, much like Transformers, and its parent company Tomy is releasing a new line of them specifically for Wild. When Zoids first came about, before they actually got an anime, they were just (really cool) model kits that came with pocket-sized storybooks about the setting. In its earliest iterations, the Zoids were less than 10x the size of humans. (I say that in such a tone because later series have the smallest ones being roughly 30x, with the biggest ones dwarfing many Super Robots.) This appears to be a throwback to that, along with some of the more recent details such as the Zoids having their own will, though we don’t yet have a lot of details beyond that. Still, many longtime Zoids fans now have children (...I hope), so this might be a great show to watch with the whole family. Time to Catch Up: None. What You Need to Watch: Play with the toys. This doesn’t appear to be connected to anything else in the series. Special thanks to Ishamael,Raitzeno, Gugsy, ThatsmaPizza, Stinolez and to Thrudgelmir2333 for proofreading my mussings and to Shade for the general editing. You guys are amazing and this thing couldn´t be made without all of you! Also a huge thanks to the whole AniTAY community and you the reader for getting to this part of the article! Happy heat waves!